This St. Patrick’s Day millions of people around the world will wear green and celebrate the Irish holiday. However there was a time when wearing the color green in Ireland could be punishable by death. In the wake of the American Revolution, revolutions and rebellions began to breakout across Europe. While much has been written on how the American Revolution helped inspire the epic and violent French Revolution in 1789, the Irish rebellion of 1798 has largely been forgotten. One of the green banners carried by Irish rebels in 1798. This one uses a phrase common in the American Revolution. Ireland watched with wonder as the American colonies united and declared independence from England in 1776. They read about how the rag tag American Army defeated the British empire. In France they watched the lower classes overthrow the aristocracy and execute their monarchs while creating a new republic. In 1794, Thaddeus Kosciuszko, a veteran of the Continental Army, led an uprising in his home country of Poland against the Russians, but was brutally crushed. Ireland, long oppressed under British rule, looked for an opportunity to rise up. 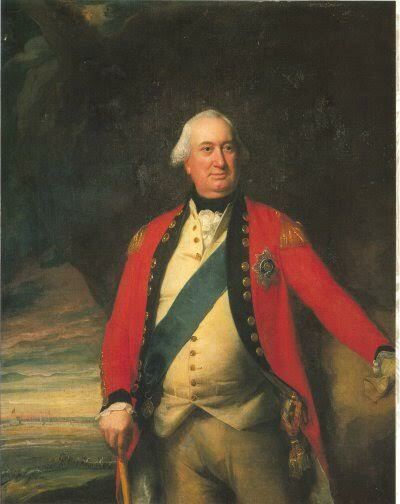 Lord Charles Cornwallis, after his surrender at Yorktown in 1781, was the Commander-in-Chief of the English forces used to suppress the Irish rebellion in 1798. Ireland, though, was a divided country over religion, between Catholics and Protestants. Throughout the eighteenth century Britain’s Penal Laws outlawed Irish Catholics from owning land, voting, or owning firearms. However, in the 1790s some Presbyterians in Ireland sought to join forces with the Catholics and fight for Irish liberty and independence in the same way they watched America do. Their leader was Theobald Wolfe Tone, and he helped found a new republican brotherhood called the United Irishmen Society. The United Irishmen used the color green as a symbol of their cause. To be caught wearing the color as a symbol of loyalty to the United Irishman could result in being arrested or executed by English authorities. With the backing of radicals who had supported American independence, such as Thomas Paine, the United Irishmen aspired to take their place on the world stage as an independent nation and made plans for an uprising. They allied themselves with the French who were currently at war with England. They planned the uprising to begin in May of 1798. Being that many of the Irish peasants didn’t have access to firearms, they gathered thousands of pikes that they would break out at the appointed hour. The planned uprising though was almost completely crushed before it even began. The leaders of the rebellion having been betrayed and pointed out to English soldiers, were mostly captured and executed before any uprising began in the city of Dublin. However, in the Irish countryside, the rebels rose up. Despite being mostly armed with pikes, the rebels defeated some isolated military outposts. However, the majority of the rebels (with many of their families) gathered on Vinegar Hill in Enniscorthy in County Wexford. On June 21, 1798, a large British force surrounded and attacked the rebels. In a short time, the outgunned rebel force was utterly destroyed. The author standing atop Vinegar Hill in 2013. An illustration of the British cavalry riding into the rebels at Vinegar Hill. While the rebellion continued through the summer, including a landing of French troops who were repulsed, the back of the rebellion was broken on top of Vinegar Hill. The British, led by none other then Lord Charles Cornwallis, were especially brutal in putting out the embers of the rebellion. One by one, the men involved in the fighting were executed or exiled from Ireland. An example of how rebel leaders in Ireland were treated was Father John Murphy. He had commanded some of the troops at Vinegar Hill. He was captured shortly after the disaster there and was immediately found guilty of treason. The Catholic priest was tortured and then hanged. After his death he was decapitated and his body burned in a barrel of tar while his head was placed on a spike as a warning to others. A monument in Enniscorthy depicting Father John Murphy and a young pikeman from 1798. The last leader to fall, was none other than Wolfe Tone. Brought to trial in November he was found guilty of treason. During his trial, Wolfe Tone invoked the memory of George Washington when he said: “After all I have done for a sacred cause, death is no sacrifice. In such enterprises, everything depends on success: Washington succeeded – Kosciusko failed. I know my fate, but I neither ask for pardon nor do I complain. I admit openly all I have said, written, and done, and am prepared to meet the consequences.” Although Wolfe Tone asked to be given a soldier’s death (shot by a firing squad), he was instead ordered to be hanged like a criminal. Before that happened however, he slit his own throat in his jail cell. The rebellion was over, but the memories of it lingered long in Irish history and has been remembered in numerous Irish songs and stories. 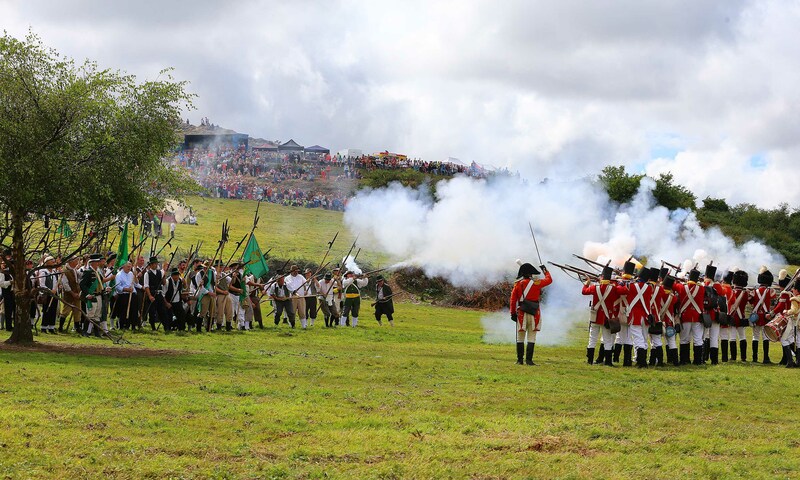 Image of the Battle of Vinegar Hill reenactment in Ireland in 2013. Today a museum in Enniscorthy tells the story of the 1798 rebellion. In recent years they have even started reenacting the tragic Battle of Vinegar Hill in order to tell this often forgotten chapter of Irish history. So this St. Patrick’s Day, proudly wear green and raise a toast to the patriots of Vinegar Hill and the cause of liberty! When you celebrate St. Patrick’s Day, celebrate freedom, and all that it takes to get there. Slainte. Really enjoyed this article and learned a great deal. I had no idea about the story behind the wearing of green. A fine synopsis of extremely difficult times in Ireland. A good historical perspective that too often remains out of sight, even for those who understand that the Irish Free State was a very long time in the making. I hope our current path in history does not discourage their will to preserve that freedom. Love all the posts, Keep it up, Very well structured and informative plus unambiguous for young people like me! I always read but hardly comment so this is a heads up that I love the posts, Cheers!